Archive with all SGF files. Move 127 in game 126 against Inoue Gennan Inseki is the famous "Ear-reddening move". Shusaku was the strongest go player of his time. He won each of the 19 Castle Games he played. Shusaku used various names. He was born as Kuwahara Torajiro (1829-06-06), used Yasuda Eisai 1835-1841, Yasuda Shusaku 1841-1848 (after reaching 2d), Kuwahara Shusaku 1848, Honinbo Shusaku 1848-1862. He died 1862-09-03. Rank promotion: 1d: 1840-01-03, 2d: 1841-10-30, 3d: 1842-08-15, 4d: 1843-11-27, 5d: 1846-12, 6d: 1848, 7d: 1853. Below we give the SGF game records for 470 games by Shusaku. They were derived from a file XiuCe_All_471.rar, with 471 games, by translating into the Latin alphabet and fixing numerous flaws. A download link for the entire collection is given above. Files 194.sgf and 263.sgf described the same game (one rotated w.r.t. the other), that is why there is no 194.sgf here. File 030.sgf has metadata only. In the literature one usually finds Japanese dates, written as if they were western. Here we give both. The prefix 'ic' for a month denotes an intercalary month. The column 'ha' gives the handicap. In order to find out who was strongest, Ota Yuzo and Shusaku planned a 30-game match. The match was aborted after game 23. We collect these 23 games here. See below for a few games that belong in between chronologically. The match was played on even (players alternating Black and White). After Game 17, the score was 10-6-1 (won-lost-jigo) for Shusaku, a 4-game lead, forcing Ota to a senaisen handicap (Black-Black-White). 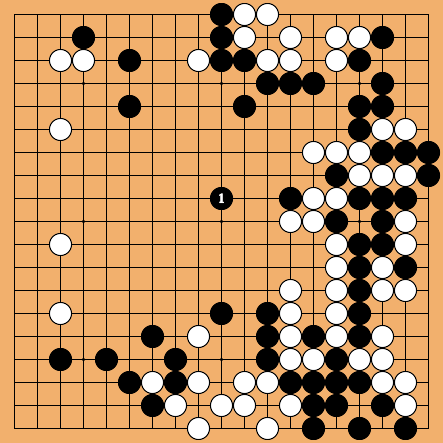 Ota never won with White, but discontinued the match after the relatively good result of a jigo with White. Above we gave all games, but let us collect the Castle Games here.